The city of Buffalo owns and operates a 200 kW Pelton impulse-type hydropower facility. The unit is in-line with their existing 14-inch municipal raw water supply pipeline to the water treatment plant. The project was funded with a loan from the Wyoming Water Development Commission. The WWDC deferred payment of principal for five years to take advantage of escalating avoided rates. A power purchase agreement was administered between the city of Buffalo and PacifiCorp (Rocky Mountain Power). The project is in year 18 of a PPA and sells the generated energy to Rocky Mountain Power at a rate of 10.65¢/kWh. The city of Buffalo is located at the base of the Bighorn Mountain Range. The city diverts water from Clear Creek and pipes it 3.6 miles to the water treatment plant. In 1995, the diversion and pipeline were reconstructed and Tie Hack Reservoir was constructed. At this time, the hydropower facility was constructed in parallel with the existing pressure reducing station on the pipeline and was online in 1998. This pipeline provides 6 cfs with 492 feet of net head to the hydro turbine. The hydropower facility is typically operated year-round. During snowmelt runoff and times when stream flows are adequate, the city uses its direct flow water rights to provide water to the turbine and water treatment plant. When stream flows are reduced and their direct flow water rights are out of priority, the city makes releases from storage in Tie Hack Reservoir to provide water to the turbine and water treatment plant. During the non-irrigation season, the municipal demand on the water treatment plant is reduced and excess water from the hydro turbine is returned to Clear Creek. The Pelton turbine utilizes approximately 213 psi and discharges into a stilling basin at the head of the water treatment plant. The turbine reduces the head into the water treatment plant instead of a pressure reducing valve. The powerhouse consists of a concrete vault buried underground and was designed to last for more than 100 years. The hydroelectric equipment is in its seventeenth year of operation and has had minimal maintenance issues. Bearings were replaced twice. The PPA allows 30 days per year of turbine downtime, but the full allotment is rarely used. The city enlisted an outside consulting firm with experience in the design and development of similar projects. The turbine, generator, and controls were manufactured by Sulzer Canada and were supplied as a water-to-wire package. The equipment has been operating without difficulty since project commissioning in 1998. Permitting and licensing of the facility were the biggest challenge to the project. The city obtained a 5 MW license exemption from FERC and a PPA from PacifiCorp (Rocky Mountain Power). This process took over two years. Part of the reason for the long timeline was due to the permitting and construction of Tie Hack Reservoir. The hydropower portion of the project cost was approximately $860,000, which included the procurement of the hydroelectric equipment and construction of the powerhouse and modification to the diversion structure and a portion of the pipeline. 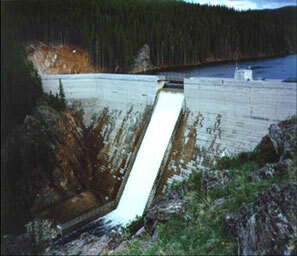 Financing for the project was provided by the Wyoming Water Development Commission. Payment on the principal of the loan was deferred five years to take advantage of escalating avoided rates. Money from the sale of energy was put into a slush fund during the deferment period and was used to pay off the loan completely within a few years. Perhaps the most important part of the success of the project was the financing and loan terms. The project would not have been able to cash flow without the deferred payments, and the city would have had to invest in the project through other financing arrangements. One of the principal project barriers was federal permitting. It took nearly two years to obtain a FERC license exemption and power purchase agreement; however, recent federal hydropower reform legislation has streamlined the federal permitting process. The FERC permitting process can take as little as three months now. The city of Cheyenne Board of Public Utilities (BOPU) manages, operates, maintains, and controls the municipal water works for the city of Cheyenne, Wyoming. The BOPU’s primary function is to provide potable water and water reclamation service to the city and other industrial and wholesale customers. Water treatment services are provided at the Sherard Water Treatment Plant. The BOPU has been interested in hydropower generation at the Sherard Water Treatment Plant for many years and has hired a consultant as part of the Sherard Hydroelectric Generation Facility Project to evaluate the technical and economic feasibility of installing a new hydroelectric generation facility at Sherard. The feasibility study recommended selection of either a single Francis turbine or a single Pelton turbine. The turbine would be rated at 700 kW and was estimated to generate 4,000 MWh annually. The feasibility study was completed in 2013, and the BOPU is holding negotiations with Cheyenne Light Fuel and Power in an effort to secure a power purchase agreement. The project would have a generating capacity of 700 kW, generating an estimated 4,000 MWh annually. The project would be at the head of the Sherard Water Treatment Plant west of Cheyenne and would operate parallel to the existing pressure reducing station. The turbine would be supplied by water stored in Crystal Reservoir and conveyed through a 15-mile pipeline utilizing approximately 212 psi at a rated flow of 20 cfs. Either a Francis or Pelton turbine was recommended, each having advantages and disadvantages. Several factors drove the recommendations of the turbine configurations. One being the water treatment plant requires 10 psi to operate, making it difficult for an impulse turbine to operate. Second, the integrity of the pipeline must remain, and pressure surges in the pipeline associated with the Francis turbine warrants the use of expensive surge protection equipment. If a hydropower facility is constructed, the biggest challenges will be in the design of the civil infrastructure necessary for the different turbine types. If a Francis turbine is chosen, extensive surge tanks and bypass controls are required to maintain the integrity of the supply pipeline. If a Pelton turbine is selected, maintaining the downstream pressure requirement to operate the water treatment plant will be a challenge. To address this challenge, the consultant recommended installing the Pelton in a powerhouse approximately 20 feet above the water treatment plant. The optimal location for siting the turbine was adjacent to the water treatment plant. This would allow the energy generated by the hydropower facility to be consumed at the water treatment plant. At this point in the project, only the total project costs and avoided costs from the electric utility have been estimated. The hydro project was estimated to cost $2.3 million. The cost estimate was nearly identical for both turbine types. Initial discussions with the local electric utility indicated the avoided costs would be 4¢/kWh. The energy generated from the hydropower facility would be directly consumed at the water treatment plant and would offset all of the energy purchased from the utility. Any excess energy the water treatment plant does not consume would be sold to the utility. This arrangement is similar to net metering, except it is anticipated the utility will charge to reserve the capacity the water treatment plant would use should the hydropower facility go offline. This type of agreement is fairly complicated, and the details have not yet been decided. Based on the initial negotiations with the electric utility, it is anticipated the project will have a payback period of 8 to 10 years and have an internal rate of return approaching 10 percent. The project is funded by the Wyoming Drinking Water State Revolving Fund. Including all the affected parties early in the development of a hydropower project is important. This case was unique to the local electric utility and working through the details of the power purchase agreement takes time. Involving the affected parties early on can help the permitting and licensing process move forward efficiently and smoothly. 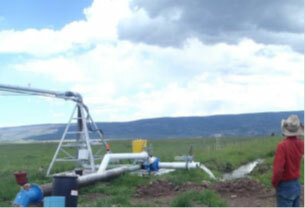 When confronted with rising water costs and low crop yields, Bear River Ranch, near Steamboat Springs, Colorado, installed a hydro-mechanical system to power its center-pivot irrigation system. This system uses the power of falling water to directly drive and pressurize the center pivot; this eliminates the need for electricity and significantly reduces operating expenses. The turbine uses 126 feet of head and 560 gpm to produce the equivalent of 5.2 kW of power which drives the center pivot. The $13,000 project was funded through $6,000 in support from NRCS, yielding out-of-pocket cost to the ranch of $7,000, and an expected payback of slightly over three years. The Natural Resources Conservation Service (NRCS) encourages water conservation by supporting the conversion of flood irrigation to sprinklers and also supports renewable energy for on-farm applications. By working with the NRCS for project design and financial assistance, Bear River Ranch was able to achieve both NRCS goals. A center pivot sprinkler was chosen as the water conservation measure, which uses significantly less water than the previous method of flood irrigation. A hydro-mechanical system was installed to eliminate the energy required to power the center pivot. The photograph at right shows the key components of the system: a turbine that powers the hydraulic pump through use of a connecting belt, and water supply lines to power the turbine and provide water to the sprinklers. A single, supply pipeline originates from a settling pond at a point 150 feet higher in elevation. This elevation difference pressurizes the water in the pipeline. 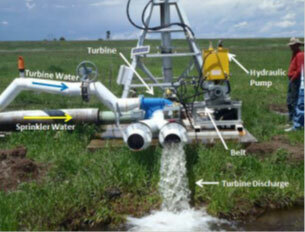 Just before reaching the center pivot, the pipeline splits into two smaller supply pipes; the pressurized water powers the turbine (via the pipe denoted with a blue arrow) and supplies the sprinklers (via the pipe denoted with a yellow arrow). The turbine is attached to a shaft that drives a belt connected to the hydraulic pump. The hydraulic pump powers the drive system that moves the center pivot wheels and turns the sprinkler system. Hydro-mechanical systems are relatively simple, so complex safety and operational procedures are typically not necessary. Because the use of hydro-mechanical systems is relatively rare, a lack of institutional knowledge has prevented their widespread use to date. The Bear River Ranch turbine produces an equivalent of 5.2 kW or 7 HP to power the hydraulic pump on the center pivot sprinkler system. The hydraulic pump powers the drive system that turns the sprinkler, and the sprinkler is pressurized through gravity. No pumps, motors, or electrical connections are required, resulting in very low annual operational expenses and minimal maintenance. Because it does not produce electricity, the project is not regulated by the Federal Energy Regulatory Commission. The center pivot is operated only during irrigation season, with operation dictated by the crop’s water demand. A T-L Irrigation hydrostatic center pivot with manual speed control was selected for the sprinkler system, and a Cornell Pump (5TR5) was selected as the turbine. Cornell pumps are easily obtainable due to their dual purpose. 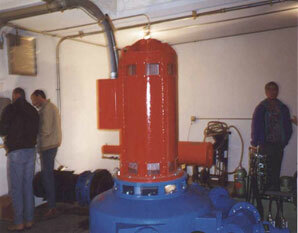 Most pumps can be used for pumping and as a turbine without any modification. Construction of the hydro-mechanical system was a fast and simple process, spanning only one non-irrigation season. The center pivot distributor, B&B Irrigation, consulted with Jordan Whittaker of Two Dot Irrigation to select the turbine and design the connection. Because the turbine and hydraulic pump are belted together, their power outputs are essentially equivalent. As such, the turbine was sized to provide 7 HP or 5.2 kW, which corresponds to the power needed for proper operation of the hydraulic pump. The turbine uses a flow of 560 gpm at the available 126 feet of working head to provide the 7 HP to the hydraulic pump. Maintenance of the system is very simple. The turbine will need to be maintained as a pump would, with occasional bearing greasing. The center pivot machinery and turbine are generally given a useful lifetime of 20 years, although with proper operation and maintenance, they can last much longer. Premature wear due to debris and sediment in the water is possible and could reduce the expected lifespan of the turbine, so care must be taken to adequately filter the water prior to its entry into the system. NRCS supported the project in the design of the irrigation system and partial funding of the entire project through the Environmental Quality Incentives Program (EQIP) program. EQIP provides financial and technical assistance to farmers and ranchers for the planning and implementation of natural resource conservation efforts. During 2011, EQIP allocated over $26 million for nearly 800 projects in Colorado. For Bear River Ranch, the NRCS grant lowered installation costs enough to make NRCS the only outside source of funding needed. The only cost incurred that varied from a traditional, electricity-driven center pivot is that of the turbine; the center pivot sprinkler and pipeline costs were equivalent to traditional center pivot installations. The purchase of the turbine amounted to $13,000 to which the NRCS contributed $6,000, making the out-of-pocket expense for the system $7,000. The system saves estimated annual energy costs of approximately $2,100. Power to spin the center pivot could alternatively have been obtained through either a diesel generator or grid interconnection if Bear River Ranch had opted for a traditional center pivot irrigation system, but this would result in annual fuel/electricity expenses. If electricity had been extended to the center pivot location, it would have cost $22,000. Center pivot systems using diesel or electricity would have higher installation costs and would have resulted in higher annual expenses. With the hydro-mechanical system, the initial investment by the ranch of $7,000 will be recaptured in 3.3 years of energy savings. The project ran successfully through the 2012 irrigation season with no problems reported and increased crop yields using less water than had historically been used with flood irrigation. Many of the ranchers in the area are expressing an interest in installing the same type of system. Some have submitted applications to the local NRCS office, which is hoping to offer design services for this type of system. Such a system can potentially be replicated throughout Colorado in areas where sufficient pressure can be generated using at least 100 to 150 feet of fall.